1. an unpleasant sensation brought on by the acceptance of inappropriate or horrible presents. 2. a reason to plan a gift registry. Making a list of wedding gift ideas is a great way to while away the afternoon with your other half – and it’ll help prevent that common post-Christmas phenomenon of Bad Gift Burn. So, if you don’t fancy the idea of coming home from the honeymoon to a bizarre collection of antique elephants, towels in a shade that could only be described as unsightly, or his-and-hers matching toilet brushes, get planning! For any other occasion, giving a gift of homewares is a political quagmire that most people wouldn’t want to get near with a proverbial bargepole. But none of the normal rules apply when compiling a gift registry. Deep down inside all of us, there is a tiny Stepford Wife who’s been aching to get out and polish the silverware. This is her moment. So grab your best matching shoes and bag and go window shopping. We won’t tell anyone. We promise. Read through our guide to compiling the perfect wedding gift registry for wedding gift ideas. Scroll through our blogs for gift registry items from brands like Royal Doulton, Tefal and Waterford, Wedgwood and Royal Albert. Try and select a wide range of gear that would be fun to give – and affordable for a range of incomes. Go for things you wouldn’t normally buy yourself – and above all, go for things you really, really want. If the idea of having everything matching frightens you, think about ‘complementing’ instead. We’ve also pinned interesting and creative gift ideas on our Wedding Gifts Pinterest board. But don’t stop there! Where homewares will provide you with a great stash of things you might never have bought yourselves, tickets can provide you with a swathe of experiences you might never have had. Be creative! Whatever you choose, remember that your guests will want to feel like they gave you something special. It’s up to you to fend off Bad Gift Burn – and ring in a new era of delicious surroundings and special moments for you and your beau. 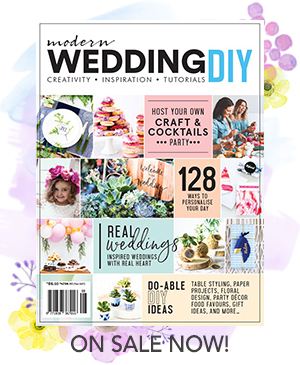 We have teamed up with The Daily Edited to show you some sweet inspiration on how to add a personal touch into your wedding day. Love Tales is a team of professional writers who create one-of-a-kind, heirloom storybooks to commemorate your wedding.